What makes people click on online ads, and what converts those clicks to actual purchases? 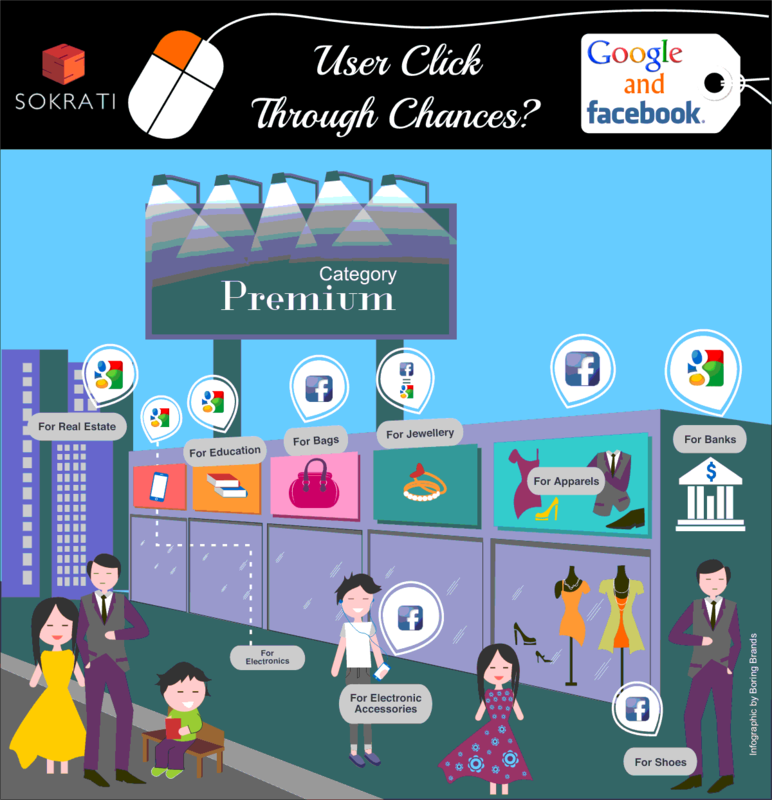 Sokrati, a leading technology based ad technology and analytics company, analyzed and compared click-through rates of Google and Facebook to explore the shopping trends of online users with respect to premium brands. The attached infographic illustrates consumer inclination. For long term investments like banking assets, banking liabilities, electronics, education and real estate, Google ads get a higher click-through rate. Impulsive buying, for premium products, have a better click-through rate via Facebook ads under categories like apparels, shoes, jewellery, bags and tech accessories. In Google ads, banking assets gets 6 times and banking liabilities gets 3.75 times more click-through rates respectively, which are the highest as compared to other products in the premium category. In Google ads, for the premium segment, real estate receives 3.09 times, electronics gets 1.9 times and education gets 1.66 times more click-through rates than the industry average for this industry. In Facebook ads apparels, shoes, bags and tech accessories gets 2.05,1.93, 2.25 and 1.93 times more click-through rates respectively, which are the highest as compared to other products under the same categories. Note: The numbers given in the table are for CTR compared to the average for the vertical and the channel. The numbers mentioned in the table are for premium categories only.